Pacific Builders of SLO has been building and remodeling custom homes in San Luis Obispo on the Central Coast of California since 1982. Building homes of exceptional quality, our high standards guide us through the building process in which we incorporate honesty, attention to detail, open communication and a dedication to providing the best service possible. We view our commitment to our clients as a long term relationship and are always available if needed. 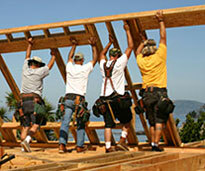 There are many questions that homeowners have regarding the residential building process. We enjoy helping you understand that process whether it’s choosing an architect or questions you may have after your project is complete. Please contact us. We look forward to hearing from you. "Our experience with Pacific Builders far exceeded our expectations. We were nervous about building our first fully custom home but very early in the process we realized we were in excellent hands. We could not be happier with the building experience and more importantly the end result!" Learn more about us and meet our staff. What you need to know before you start building or remodeling your home. A photo gallery of projects we have completed in the San Luis Obispo area. Copyright © Pacific Builders | CSL #854395 | References provided on request.